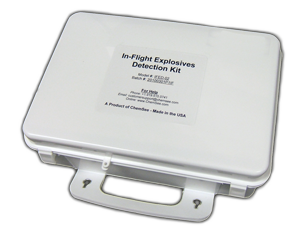 The In-Flight Explosives Detection Kit allows any stewardess, pilot, or traveler to determine in less than 3 minutes if a suspicious powder, solid or liquid found on board an airplane is an explosive or could be used to make an explosive. The In-Flight Explosives Detection Kit, (IFED), comes with five separate detectors for explosives and explosive precursors. The IFED contains no harmful solvents or aerosols and can be used safely on-board aircraft, even in flight. The Kit is small (10x7x3″) and lightweight (410gm), making it easy to carry and store on aircraft. All detectors form color when the target explosive or precursor is present. They are simple to use, even for unskilled personnel and give results in seconds.